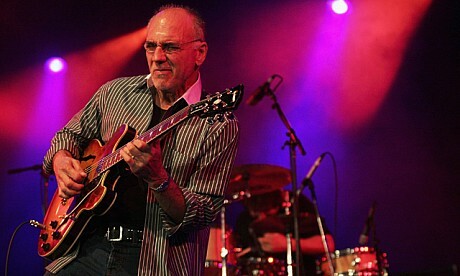 You've almost certainly heard Larry Carlton's distinctive guitar chops – even if you haven't realised it. After picking up the guitar at the age of six, Carlton developed into a much in-demand studio player throughout the '70s and '80s, laying down licks on records by Joni Mitchell, Sammy Davis Jr, Billy Joel, Jerry Garcia, Dolly Parton, John Lennon, Quincy Jones, The Four Tops, Barbra Streisand – and even Michael Jackson's Off the Wall. One such lick, his tasty run on Steely Dan's 'Kid Charlemagne', was rated by Rolling Stone magazine as the third greatest guitar lick in rock. Also playing with The Crusaders for 13 years and working on numerous film and TV soundtracks, including Bruce Lee classic Enter the Dragon, in the early '70s Carlton struck off on his own producing a consistent run of instrumental jazz-fusion and smooth jazz records, picking up his fourth Grammy last year for Take Your Pick, named Best Pop Instrumental Album. Now aged 65 and continuing to play more than 100 shows across the globe every year, we caught up with Carlton ahead of his headline slot at the Dubai Jazz Festival on Friday February 14. He's known as 'Mr 335', for his distinctive 'sweet' guitar tone on a Gibson ES-335. He worked on all of Joni Mitchell's classic late-'70s jazz-influenced records, including Court and Spark and career high Hejira. He played alongside jazz legends Stanley Clark and Billy Cobham in a jazz supergroup, captured on the Clarke's LP Live at the Greek. But that was nothing compared with working with Miles Davis on the soundrack to Bill Murray movie Scrooged (1988), where both men made a cameo. He prefers to play guitar with his eyes closed. His playing has reached more than 20 million pairs of ears with 'She's Out of My Life' from Michael Jackson's Off the Wall. He can take or leave the 'smooth jazz' classification. This article has been viewed 3,187 times since being added on February 11, 2014.